Mary Morrissey’s inspiring words of wisdom lift you out of bed each morning, both physically and spiritually! Mary shares messages from her book The Miracle Minute, to jump start each day with a miracle mindset! 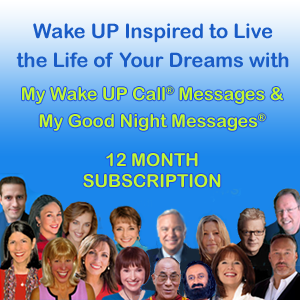 Wake UP Inspired by Words of Wisdom Daily Messages from Mary Morrissey! 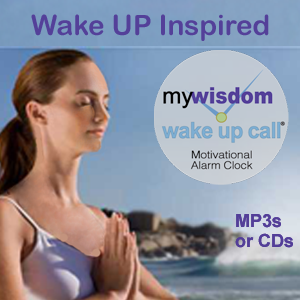 Get 5-minutes of inspiration – whenever and wherever you need it – with My Wisdom Wake UP Call® daily messages with thought leader, Mary Morrissey! Wake up inspired every morning, instead of with a blaring buzzer or negative news with Mary Morrissey’s words of wisdom. Patented daily 5-minute motivating messages. Speaker, best-selling author, minister and consultant for over three decades, Mary Morrissey’s transformational talks and seminars have made her one of the elite teachers in the human potential movement. Mary is the founder and CEO of LifeSOULutions, a successful international company providing programs and products that transform dreams into reality. Mary has spoken at the United Nations, met with Nelson Mandela, lead meetings with the Dalai Lama, and authored two best-selling books, No Less Than Greatness and Building Your Field of Dreams.